The following is taken from a series of articles published in 1934 by Andy Lytle. One morning in April 1923 the sports room of the old province building at Vancouver was brightened by the appearance of a brown eyed boy. He was followed by a man in his early fifties whose large frame filled the doorway and who pulled at his forelock in a curious Cockney fashion as he shuffled Sheepishly into the room. Scanning the noon edition I was in no mood to be disturbed but the winning smile of the kid was disarming.“I’m Jimmy McLarnin Mr. little” he said “ and this is my manager Mr. Charlie Foster”.They had come this strangely assorted pair, they said, to thank the newspapers for having given Jimmy the best of it the night before when he had lost an Amateur bout to Mickey Gill, then and for some months later Jimmy’s greatest rival. <>Thus an acquaintance that ripened into friendship began between myself and a boy who was destined to grow into one of the worlds greatest fistic figures. The night before Jimmy had dropped the decision to Mickey Gill in a fight for the Amateur featherweight title of B.C. The referee George Paris, a colored man who was caught in Paris with Jack Johnson when war broke out in 1914, and who had been Trainer, boxer, handler of athletes all his life, had a sentimental interest in Gill. The fight took place in a ring pitched in a ball park on a rainy night and had been close and fierce .McLarnin and Gill were deadly rivals, both were products of East – End clubs , slugged it out toe to toe. I thought, and so did one of the judges, that Mclarnin had won by superior boxing. The Judges divided. The kids went an extra two minute round and at the end of which Paris elevated Gill’s hand. I pulled some strings to get the kids rematched and because A.E. “Bert” Tennant, then a well known official in Canadian amateur athletics, felt that an injustice had Been done Gill and McLarnin met a week or two later and this time McLarnin’s surpassing boxing skill made him an easy winner. From then on the guileless youth and the tight lipped suspicious man who became his manager trod the path of life together In the dual roles of doting son and protective father. 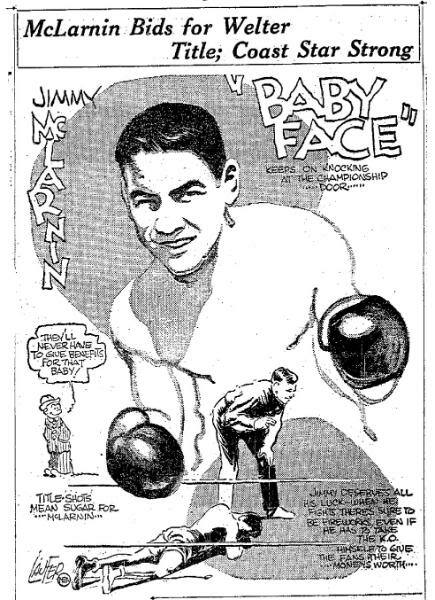 To understand Jimmy McLarnin and the somewhat narrow lane, judged by modern standards at least, down which he had pursued his way as steadfastly as a second Gene Tunney, a glimpse at his background is necessary. His parents, both Irish, migrated to the Canadian prairies. “We made a trip home” his father told me “ and Jimmy was draped in Dublin”. McLarnin fought as a professional In California before he was 16. he was a headliner in New York at least two years before he was 21. <>Boxing leaders are seldom scrupulous .needs must when the dollar drives .McLarnin is not the first boy to have his age “lifted” to suit the rulers of the sport. But this leads to erroneous birth dates being accepted. The record books give Jimmy’s birth date as 1906 but he was born at least two years before that. I doubt whether Jimmy or his parents really know the correct answer.His father told me Jimmy was born in August, jimmy says it was December, his mother is not sure but Jimmy knows. Jimmy was a lad of two or three when the McLarnin family, large then and steadily growing, migrated from the Prairies to Vancouver. Sam McLarnin, the father, a typical Dublin Irishman, operated a second hand establishment in Vancouver’s East End and into these precincts Charlie “Pop” Foster often ambled for a smoke, a chat or the odd pick-me-up. <>Jimmy was a prominent kid athlete in the Methodist mission flock of the Rev. A.E. Roberts. He was proficient in any game at which he engaged. He loved them all and judged by the little mission standards he was a three letter man at football, baseball and boxing. He excelled in the gym and was considered a model of propriety by the tired little Pastor of such an unruly flock. One day Pop foster saw the lithe youngster going around an opponent in a street fight between newspaper boys. Flashing, bobbing , ducking, hitting hard and then getting away. Foster asked the boy’s name and immediately hot footed it In the direction of his crony Sam McLarnin. On his way to see McLarnin it is assumed that Pop Foster paid a visit or two, but anyway, in a dingy barn like room cluttered with the countless odds and ends of the second hand dealer and possibly over the stimulus of a glass or two, these Cronies, the Irishman struggling to raise a boisterous family of thirteen and the Englishman whose proud boast is that he once handled the great “Spike Robson” of England fixed the future for the smiling boy who was to become a worlds champion, a young man of wealth, a highly respected man of society and the hardest puncher of his weight in his generation. <>“ that boy Jimmy of yours “ I expected Foster opened the conviviality’s .“I could somthin wid him if ed do as I tell im “…”I could make him a champion. E’s another Spike Robson Sam” Sam McCLarnin laughed at the whimsies of his companion . Foster would have his little joke. “Young Jimmy, that artful imp. …a champion ? ..Charlie would be the death of him yet with his queer notions , Jimmy another Spike Robson ?..” Ooo the ell was Spike Robson, he’d like to know”. Ten years later Sam McLarnin was to sit in the sumptuous Ambassador hotel in Los Angeles , within a soft whisper of the celebrated Coconut Grove ball room where the youth and beauty of Hollywood and California gravitate nightly and listen with a twisted smile on his worn face while a world applauded and fawned over his son as it acclaimed him the worlds welterweight champion. <>As they clinked their glasses together again this surely was a night to remember, I can hear Foster Saying “I told ye the boy would be a champion Sam, didn’t I say he was another Spike Robson that afternoon in the old store at Vancouver”. And Sam McLarnin sitting amidst the luxury of surroundings, the beauty of which his eyes had never before seen, pressed his crony of the bygone poverty stricken days and told himself again and again, that he always knew Jimmy would do it.Wasn’t he after all a McLarnin. <>Before the precious pair were through that afternoon in Vancouver however, the father had agreed that Charlie Foster, boxer,trainer, soldier in the world war and a rousterbout longshoreman on the Vancouver docks, was to guide the fistic destinies of his son James archibal McLarnin. They signed up right there. 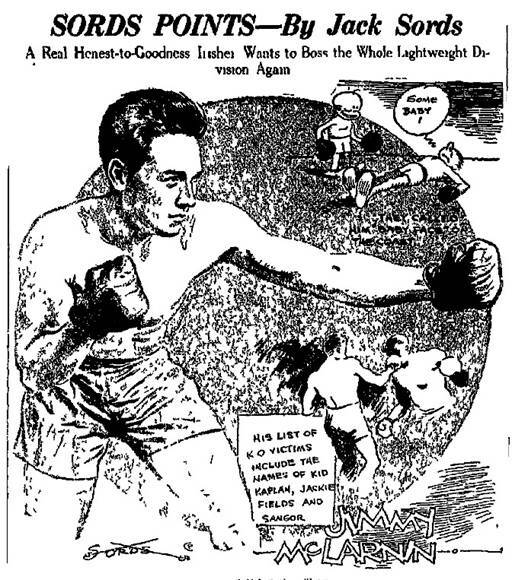 I doubt if there are six people in the world who have glimpsed the document by which Jimmy was apprenticed to the rough, un cultured man who has since earned the respect of every big promoter of sports on this continent, the envy of many fight promoters, the dislike of chiseling sports writers and a comfortable fortune from the fighting fists of a boy whose respect and admiration he has held throughout the years of their joint friendship. Shortly after Foster took Jimmy under his direction the boy turned professional. There was no hesitancy about it. Both were frankly in the game for what they could reap in monetary reward. “what good is a medal” Jimmy asked as a kid of thirteen. Scornfully Foster spat and agreed they were not edible. im Tracey, a big Australian who had flopped in New York and was on his way home again, paused For a time in Vancouver and promoted shows in a dingy upstairs club on Hastings Street. There McLarnin and Mickey Gill re-fought their earlier six round routes and tops for the winner, as Foster and Jimmy have bitterly recalled, was $25. “I fought this nonaimo “( no name oh) Jimmy said years later. Was hard a bout as I ever had and received $2.50 for my end what did Vancouver or Canada for that matter ever do for us”. “We had to go to the United States to make our money. We owe Vancouver nothing”. <> After his second campaign in California when he was barely sixteen Jimmy came home in the autumn And jack Allan matched him against Gill as the major ten round attraction on his fight card at the old Arena.<> Poor Gate <>It didn’t draw more than $3000 and it was a poor show although McLarnin won on points. A year later efforts were made by Allan and others to match Jimmy with Vic Foley. Foster did consider Promoting a match for McLarnin in Vancouver , he dickered for a site in New Westminster. Allan was assisted in his promotions by George Paris, whom Foster never forgave for that decision Against Jimmy in the rain swept ball park and ultimately Foster turned a negative ear to all opportunities to let Jimmy show again in Vancouver. McLarnin has not fought on British soil since. He has never appeared publicly in a Canadian city. Offers came to them from time to time but the size of the purse was never sizable to interest Foster for a moment. Late in march 1924 the smiling kid and the sour old man decided the golden hills of California were calling. Back in 1924 it was a whole lot harder to convince promoters that the baby faced lad with the pink Cheeks and soft brown eyes packed a wallop in each fist like the kick of a mule. In those days “Pop” Foster had to wear himself out trying to land fights for his unknown protégé , know he lets the big fellows hunt him down and doesn’t sign on the dotted line until the terms suit him. Greener than the grass their crazy chariot groaned over on its way south they lived by their faith and the Few dollars in their possession .somehow they reached Oakland across the bay from San Francisco early In May which indeed seems Jimmys month of destiny. A letter or two of introductions to sports Writers was the only entry they had to their goal and one morning they shuffled into the offices of Tommy Simpson who operated a fight club. “What you doing, towing that kid around” Simpson barked “I’m not running a kindergarten , send the child back to school or better still go buy him a a kiddie car and let him play”. The next few weeks were the bitterest of their careers .everywhere the hard face boxing men laughed At the shuffling old figure with the cherubic youngster wonder eyed at his heels. Some grew angry At the persistence of the pair, others pitied them. One or two offered money which was proudly spurned. “We’ll fight and earn our money” Foster would say. ”All we need is a chance to show the boy is a real card. Just give him a fight, you’ll be bidding for him after that”. Promoters laughed and shook their heads. Foster’s experience along the water fronts and of ports In many lands stood them in good stead.They lived in a shack on the bay shore.Foster got hold of a boat And while Jimmy rowed the boat up and down the old man fished for crabs and other sea foods with Which these waters abound. Always they persisted in their efforts to get Jimmy started. Finally Simpson relented and matched Jimmy With a tough little slugger about his own insignificant weight. The speed and boxing skill of the kid they Had ignored for weeks stampeded the house. Next morning “Baby Face” McLarnin was blazoned in the newspapers and the last great obstacle in the fistic path of McLarnin and his manager had been successfully hurdled. <>Jimmy was at last in great demand and although he boxed mostly in preliminaries his record of wins Was impressive. Keen as a racing thoroughbred and knowing the need for money at home Jimmy Would have boxed on every card except for the canniness of his manager. “there’s plenty of time to make the money Jimmy”he would say in his drawling speech”We’re doing all right, we’ll just go along easy”. That fall when they came North the first of many changes had begun.Jimmy wore flashy rainment , cheap And somewhat gaudy, Foster a suit of hand-me-downs and a new cap, his hair was neatly trimmed. Early spring found them headed again for California.this time promoters werer bidding for their services.Oakland had grown Too small for Jimmy, San Fransisco wasn’t too hot.they went to Los Angeles where Jimmy knocked out Jackie Fields in two rounds and the newspapermen hailed him as the “Californian Sensation” and the “Belfast Spider”. This irked Vancouver people who protested that Jimmy was theirs and a thorough Canadian. Embittered by his years of indifferent occupation there Foster scoffed at these overtures and was deliberate and calculative in heightening the Californian impression. “ It makes Jimmy a better drawing card” he said.”what did Vancouver ever do for the boy” <>in New York three years later when Jimmy was making his first bid for the title against Sammy Mandell Foster took me aside at Jimmy’s camp out in the Jersey hills and asked me not to bring up Vancouver in conversation with sports writers regarding the challenge. “It does the boy no good” he said “ It helps if they think he’s a Californian”. We want the big gate”.That is the alpha and th omega of the McLarnin-Foster creed .Jimmy soon saw that his flaming fists Were the quick road to the wealth he craved. Foster, starved and beaten by the wings of a cruel earlier fate, was equally determined to wring the last pound of his juicy flesh in all of their fight contracts. Two highlights of Jimmy’s meteoric career barely approaching it’s zenith in 1925 occurred that year. After knocking out Fields, a recent Olympiad sensation and the pride of California native sons, Jimmy beat Fidel La Barba another Californian ace in ten rounds and three or four other well rated boys. Frank Churchill, then a big fistic figure who dealt mainy with Filipinos who he brought over from the islands through extensive connections he had there, had just completed a triumphal tour of the east with Little Pancho Villa. Matching Pancho with McLarnin was a natural, it packed the big stadium to capacity.Villa took the match at short notice and never a clean liver he was probably much nearer to burned out than even his handlers knew. 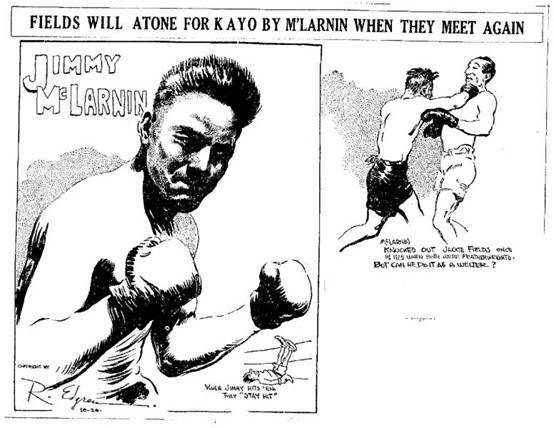 In that super heated arena before thousands of maddened fans Mclarnin and the swarthy,broad shouldered little Pancho slugged it out for ten rounds.McLarnin took the decision handily .Two days later Villa was dead.Stories of the cause of his death conflicted.it was given out that the little brown man died from infected teeth but many Californians still hold it was the unmerciful punishment handed out to him that brought early death to one of the rings mightiest atoms.